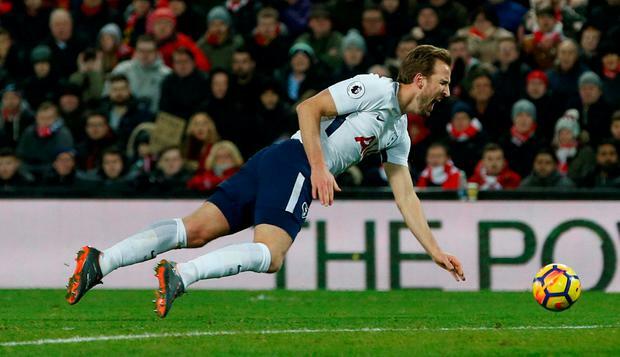 Harry Kane rejected diving accusations and set his sights on scoring his next 100 Premier League goals after completing Spurs' extraordinary recovery mission at Liverpool. Kane’s latest milestone was earned in controversial circumstances, Liverpool defender Virgil Van Dijk accusing him and Erik Lamela of conning the referee to earn two penalties at Anfield. The striker - now the quickest to 100 Premier League goals - is having none of it, insisting he was clipped by Loris Karius for the first. “Yeah. He has dived, he has got in the way and I'm a player, I'm not going to jump out of the way because it's football,” said Kane. “I've definitely felt contact and I've gone down. Lamela's one I thought the linesman showed amazing character to give that because a lot happened for the first one about the linesman so to give that penalty was massive and it was a penalty. Kane said he was sure he would convert second time around. “Never a doubt,” he said. Away from the penalty debate, it was a much improved, more improved Tottenham. They have often struggled at the toughest venues but ther second half display earned the point. And having reached his century, Kane is already thinking of the day he hits his 200th. “That has to be the aim – and hopefully quicker than I got to 100,” he said. “It is nice, I am going to enjoy the moment, but let's see how many I can get this year and go from there. “Hopefully I can get better and better. I am 24 years old, that's not young but it's not old so I've still got a lot of learning to do. I feel I am getting more experience year by year and I feel I am getting stronger and more physical and hopefully that just continues. I will always keep trying to work hard and get better and hopefully that will be the case. “I've said that from the very first time I got put on the scene. That is what separates good players from great players: can you do it consistently year after year? Can you get better and better when people don't expect you to? That's what I've done so far and that is what I will continue to strive to do. That is always my mindset to never let up. It is a short career and I'll try to do as much as I can in it." Others who have hit the 100 goal mark – such as Alan Shearer – have had a statue built in their honour. “I'm not thinking about a statue, I'm just thinking about what's best for the team,” said Kane. Damian Spellman Ayoze Perez's hat-trick all but guaranteed Premier League safety as Newcastle survived a second-half fightback by Southampton to win 3-1. Jonathan Veal Manchester City manager Pep Guardiola is waiting to find out the severity of Kevin De Bruyne's injury suffered in the 1-0 win over Tottenham. Independent.ie Newsdesk Brighton battled to a goalless draw at Wolves, which edged them three points clear of 18th-placed Cardiff and avoided a fifth straight league defeat.